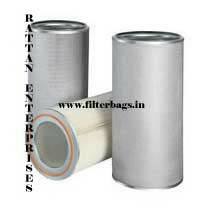 Gas Turbine Air Intake Filter Cartridges are modern and reliable for air intake applications. Gas Turbine Air Intake Filter Cartridges ensure high efficient filtration of dust and other contaminants, even in the most polluted environments. Normally Gas Turbine Air Intake Filter Cartridges are made of mixture of polyester & cellulose and sometime 100% polyester media. These media have much better pleatability & dimensional stability. Pleated filter media offer high filtration efficiency, easy clean ability, very fine retention level & aesthetically good product than other normal filter media.